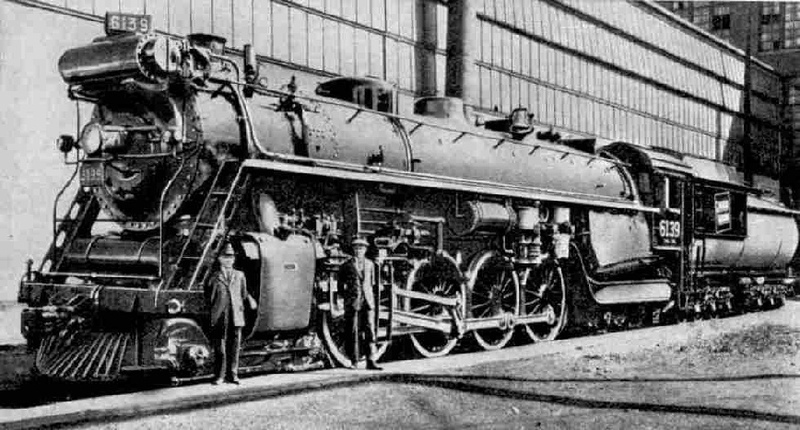 4-8-4 Express Locomotive, Canadian National Railways, “6300” class. This type is used for working the “International Limited” over United States territory between Port Huron and Chicago. ONCE again those travelling bags of yours are to be requisitioned this month. We are about to make a trip over the largest railway in the whole world, and this makes it necessary for us to cross the Atlantic and set foot on the Continent that lays claim to one-half of the three-quarters-of-a-million miles of railway that have been laid, up to the present date, over the world’s surface. The railway in question is the immense system in Canada known as the Canadian National Railways, incorporating the old Grand Trunk, the Canadian Northern, and various other lines. Controlling as they do no less than 22,675 route miles of line, the Canadian National management are responsible for an aggregate mileage only less by a mere one thousand miles than the total length of all the railways in Great Britain, A very large proportion of the territory served by the Canadian National Railways is thinly populated, however, so that most of the Canadian National mileage is only single-tracked, and in the case of a large number of branches one passenger train each way per day - and sometimes one only on every alternate or every third day - suffices to meet the needs of the traffic. In fact, only 1,200 miles of the Canadian National lines are double-tracked. Starting from Sydney, on the Atlantic coast in the extreme east of Cape Breton Island, from which the passage across to the mainland of Nova Scotia is made by train-ferry from Port Tupper to Mulgrave, the Canadian National can take you for the world’s longest continuous railway journey over one railway system - 4,127 miles - in its own trains throughout, to Prince Rupert, on the Pacific coast of British Columbia. The journey of 3,941 miles from Sydney to the better-known Pacific seaport of Vancouver can, indeed, be accomplished with but one change of trains intermediately, at Montreal. What is more, this is an “all-red” route, as throughout its traverse of the North American Continent the Canadian National main line concerned never once leaves Canadian territory. At the same time the Canadian National authorities have vital interests in the United States. Most important, probably, and busiest of their main lines, is the one travelling south-westward from Quebec and Montreal up the River St. Lawrence and then along the north shore of Lake Ontario to Toronto, whence it continues through London - with a branch to Windsor, and Detroit, famous as the home of the Ford car - to Sarnia. Here the line burrows under the St. Clair River, connecting the lakes of Erie and Huron, by means of the St. Clair Tunnel, whence it passes into the United States and continues for 334 miles in USA territory to the great Middle West city of Chicago. From Montreal the whole of the 848 miles to Chicago are double-tracked throughout. Within United States territory the old name of “Grand Trunk” is retained, though the control is completely in the hands of the Canadian National Railways. It is over this route that we shall presently travel. Dividing the bulk of the Canadian National system from the lines in New Brunswick and Nova Scotia and a part of Quebec, is the wide waterway of the River St. Lawrence, Below Montreal this is bridged at one point only. For many years there was no railway communication across the river east of the great Victoria Bridge at Montreal, over which passes the main flow of the traffic between the Maritime Provinces and the mainland of Canada. But of later years, in order to give direct access from Quebec to New Brunswick and the Atlantic seaboard, the more remarkable Quebec Bridge has come into being. The history of this structure is one of the great romances of modern engineering. The latest type of CNR Compartment Sleeping Car. The size and luxurious fittings of these cars may be judged by comparing this compartment with the best available on English trains. Meanwhile it is high time that we began to think about the train by which we are to travel. As we have already crossed the Continent by means of the “Trans-Canada Limited” of the Canadian Pacific, we will try a change of direction this time, and make use of the “International Limited” of the Canadian National Railways. The title is derived from the fact that the train directly connects two countries - Canada and the United States - running through between the Canadian cities of Montreal and Toronto and the American city of Chicago. We must be at Bonaventure Station at Montreal some time well before ten o’clock in the morning, when we are due to leave. Connecting trains, such as the famous “Acadian” and the “Ocean Limited”, have brought their through passengers from the Maritime Provinces; at Montreal they must change into the “'Inter-national Limited” for the continuation of the journey. We are struck, first of all, by the difference between the station and the type of station to which we are accustomed in Great Britain. With the temperature well below freezing point, as it certainly is at this present moment, and possibly even below zero, no Canadian passengers want to wait for their trains on exposed platforms. The platforms themselves, therefore, are little more than pathways to the trains, raised very slightly above the tracks; but the interior of the station, designed on very palatial lines, would, we shall agree, put not a few of our British terminals in the shade. The first effect of the low platform is to emphasise the size of the rolling stock used in America. Certain of the coaches in our train are of all-steel construction, up to 80 or 82 ft in length and no less than 75 to 78 tons in weight, as against the maximum of 70 ft and 45 tons - in the case of the heaviest dining and sleeping cars - in Great Britain. Every one of these coaches, we notice, is carried on 12 wheels, we can see that the the gauge between the rails is equal to the 4 ft 8½-in, yet the height available, beneath bridges and tunnels, in which to build the rolling stock, is 15 ft 3-in, as compared with a maximum of 13 ft to 13 ft 6-in in the Home Country. In America, too, there is width available on each side of the track more than in proportion to the increased height. The absence of platforms, which in England cut off 3 ft 6-in of the height of the vehicles standing at them, adds yet further, as just mentioned, to the apparent height; so that in mounting the Canadian cars by the flight of steps provided at each end we feel pygmies indeed in contrast to such enormous coaches. passenger for the use of Pullman accommodation. Our “International Limited” is composed entirely of Pullman and first-class accommodation. Its formation will vary according to the season and the number of expected travellers, but may be taken as an average of 12 vehicles, two of them being baggage cars, two first-class passenger cars, a dining car, two “parlor” or drawing-room cars, four sleeping cars, and on the rear a compartment car (all the others are open cars) with a library and an observation platform at the back end. The tare or empty weight of this train of 12 vehicles is 850 tons, or 350 tons heavier than the very biggest expresses worked in normal service in Great Britain. But it is the engine that is by far the most impressive feature of the turn-out. Easily the biggest and most powerful loco-motive that we have yet seen on one of our journeys - and the biggest passenger locomotive in the British Empire until displaced quite recently by another Canadian type that is very slightly larger - the Canadian National “Confederation” class weigh, with their tenders, 289 tons each in full working order. Eight coupled driving wheels are provided, in order that there may be sufficient adhesion weight to transmit to the rail the power developed in two 25½-in by 30-in cylinders; and not only is the engine provided with a leading bogie, but a bogie is also necessary at the rear end to carry the enormous firebox. The wheel arrangement is therefore 4-8-4, as compared with the 4 -6-2 type that represents the biggest development of passenger power in Great Britain to present date. There are differences innumerable to be noticed between American and British locomotive practice. Starting at the front end, there is the feed-water heater, carried across the front of the smokebox in the only position available for its accommodation. Below we see the powerful electric headlight and the “cowcatcher”, which together are a reminder that railways in the American Continent are not fenced , as they are in this country, so that it is necessary to provide against the presence on the track of the “trespasser”, and for seeing possible obstructions ahead. Mounted on the top of the boiler is a large bell, which clangs dismally as we approach the many “grade” or level crossings on the route, and as, in certain places, we actually proceed at a snail’s pace along the streets of the towns. Looking behind the wheels, we notice that the main frames of the engine are formed by an assemblage of steel bars, now usually composed of various sections of steel castings firmly bolted together. The “bar” frame is the American alternative to the British plate frame. All the wheels are exposed to view by the high level of the “running-plate”, on to which the driver can step by a door in the front of the cab; and the engine appears to carry a large proportion of its parts distributed in somewhat unsightly fashion over its exterior But there is reason for this, as the parts thus disposed externally are much more easily got at for repairs and attention than in their concealed positions on many British designs. 4-8-4 Express Locomotive “Confederation” (6100) Class, Canadian National Railways. An engine of this type is used to work the “International Limited” throughout the 511 miles from Montreal to Sarnia without change. The rear pair of bogie wheels under the firebox of the engine are provided with driving power of their own. A small two-cylinder engine is attached to the rear bogie truck, and provides valuable assistance to the main cylinders of the engine when the latter is starting or tackling heavy grades with our enormously heavy train. As soon as the train gets into speed, the driver - or, as he is called over here, the “engineer” - can, by means of suitable gearing, cut the auxiliary engine out of mesh altogether, just as you might bring your free-wheel into operation on your bicycle; so that it does not oppose any frictional resistance to high speeds nor does it constitute a perpetual drain on the steam supply of the boiler. In expressive American language, the small two-cylinder engine is called a “booster”, because it helps to “boost” things up at the start. It has been tried in Great Britain, and is fitted to “Atlantic” No. 4419 and the two large “Mikado” (2-3-2) freight engines of the LNER; in all three cases driving the rear pair of wheels. The “Confederation” class engines are rated as capable of hauling sixteen 12-wheeled cars on these trains, with a total weight behind the tender of at least 1,150 tons. The tender of the “Confederation” is in itself a study. It is carried on 12 wheels, and we see that for the most part it resembles a vast steel barrel. This is the water-tank, capable of accommodating 11,300 gallons of water at one time. On the top of the tank, at the forward end, is arranged the coal space, where 20 tons of coal is the maximum provided for. It need hardly be said that no fireman is capable of handling manually the amount of fuel consumed by a locomotive of proportions such as these. Automatic stoking is, therefore, provided, a conveyor passing the coal from the tender direct into the firebox. The rate of feed is under exact control by the crew, and can be varied according to the relative severity of the work to be performed by the locomotive over each section of the journey. There is also equipment for shaking up the fire-grate, to prevent the formation of clinker. As we board our car, we are welcomed pleasantly by a conductor. We may have reserved a sleeping car berth, of which as yet we can see no signs; or a “drawing room”, which is a separate compartment at the end of the car, with four berths; or, yet again, a single-berth sleeping compartment, of the type to which we are accustomed in Great Britain, and which is just now coming into use in Canada. The supplementary price for the three grades of travel rises in proportion to the privacy afforded. So, at ten o’clock in the morning, we get away from Montreal. To our ideas, the start may be somewhat jerky, but getting on the move these heavy all-steel American trains, with their rigidly-coupled cars, is not an easy business even for so gigantic a locomotive as one of the “Confederations”. The fastest running of the “International Limited” is made over the 334 miles between Montreal and Toronto. Here the country is level, and the Canadian Pacific also run a service between the two cities, the trains by the competing routes being actually within sight of each other over certain sections of their journeys, with results that can be imagined! We need not expect any non-stop runs of great length, as facilities must be given to many important towns intermediately. Actually we make 24 stops in the 334 miles, the longest run without a break being the 46¼ miles from Cornwall to Prescott, covered in 51 minutes, at an average start-to-stop speed of 54.4 m.p.h. This is also the fastest point-to-point booking of the whole trip. It is 5.40 in the evening when we run into Toronto, our average speed to this point, inclusive of all stops, being 43.6 m.p.h. We may be surprised, on going to look at the engine in the 20 minutes’ wait allowed at Toronto, to find at the head of the train the same engine that pulled us out of Montreal. And not only so, but to our astonishment it is not being detached even yet. 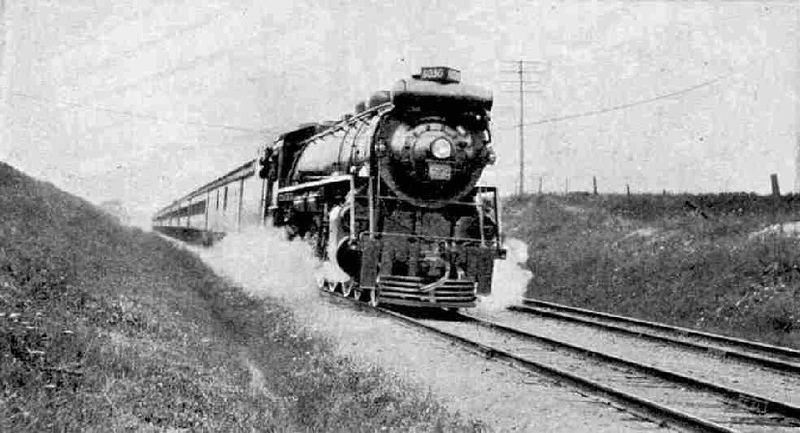 One engine of the “Confederation” type works the “International Limited” right through without change over the 511 miles from Montreal to Sarnia, at the Canadian frontier, the complete trip taking 10 minutes under 13 hours. The return journey is made on the following day. Needless to say, the same engine-crew do not work through; enginemen are changed three times, at Brockville, Belleville and Toronto. The last stage, from 6.0 to 10.50 p.m, is the longest continuous spell. 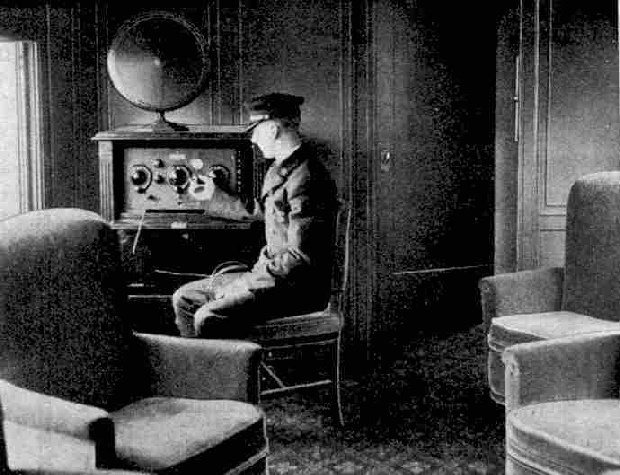 After leaving Toronto, before or after dinner, we very likely gravitate to the observation car, where we find an attendant manipulating a fine radio set up in one corner, and each armchair equipped with head-phones. The Canadian National Railways are the only system in the world to control their own extensive radio service. Eleven broadcasting stations send out their programmes, from Moncton in the east to Vancouver in the west, and these programmes are picked up in the chief express trains for the amusement of passengers. The radio has another use, too, in that it enables the management of the railway to keep in touch with their employees all over this huge system, many of them located in very isolated and in some cases almost inaccessible places. The radio operator at work on the “International Limited” Express. As explained in the article, the CNR are the only system in the world to control their own extensive radio service. Of the eight stops between Toronto and Sarnia, the most important is at London, where through day coaches and parlor cars are detached for Detroit, and are replaced by sleeping cars from Detroit for Chicago, 20 minutes being allowed for the marshalling. Sarnia is reached at 10.50 p.m, and here at last our hard-worked steed is detached from the train and replaced by an electric locomotive for the three-mile journey through the St. Clair Tunnel to Port Huron. Another 4-8-4 locomotive, of a slightly different type, is awaiting us on the other side of the river, and will haul us over the final 334 miles from Port Huron to Chicago. On crossing the United States frontier we put our watches back an hour in order to agree with the time observed in the Middle West of the USA. So at 10.30 p.m. we make our start in United States territory, through which we are to travel for just short of nine hours. By now all the sleeping berths will have been made up by our conductor. In the ordinary sleeping cars they are all long-itudinal, the seats being pulled out to meet and form the lower berths, while the upper are let down from the roof of the car. 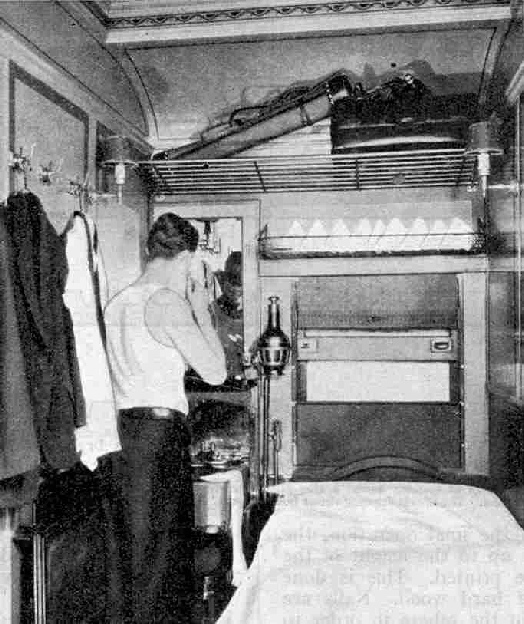 Curtains are then drawn down both sides of the central gangway, and with this somewhat scanty privacy we have to undress in our berths and get to sleep. Through the night our 4-8-4 giant is forging on, and experiences but one change of crew, at Battle Creek. The longest run on this section of the journey is over the 63¾ miles from Fort Huron to Flint, allowed 84 minutes. In all, 10 stops are made between Port Huron and Chicago At Valparaiso a fresh dining car is attached in place of the one that we lost at London, in order to provide for our breakfast; and at 7.25 a.m, 22½ hours after leaving Montreal, we pull into Chicago. Our 848-mile trip is at an end. and although the average speed of 38 miles an hour that we have made throughout the journey may not seem to us very high, yet, when all the stops and speed reductions have been allowed for, we have witnessed, probably, some harder continuous locomotive work performed than ever before in our lives. The “International Limited” at full speed. You can read more on “The Doorway to Canada”, “The Opening-up of Canada”, and “The Trans-Canada Limited” on this website.